Whether it’s referred to as “Dirt and Worms Cake,” or “Mud Pie,” we’ve all heard of some variation of it; made with instant pudding and crushed oreos, this dessert is great to make with kids, and once you see just how cute ours turned out, you and the little ones will be chomping at the bit to make this! What makes this one so special is that it looks like a real garden. 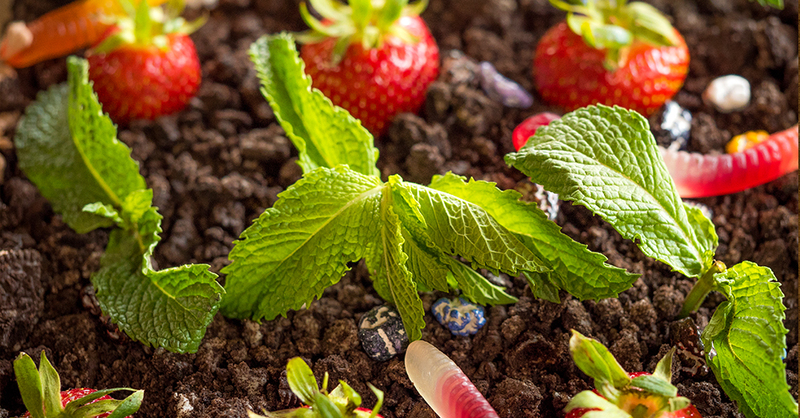 Fold your (gummy) worms into the dirt pudding mixture, then let the kiddos plant rows of strawberries and mint in the oreo soil. We found some rock-shaped chocolate candies at the grocery store, so we sprinkled some of those on top, then took a step back and admired our kids’ handiwork. Whether it’s for Mother’s or Father’s Day, or just a time when you want to make something as a family, this is a fun, delicious treat that everyone can get excited about! Pour chocolate pudding dry mix into a large bowl and whisk in cold milk. Stir for 2-3 minutes, or until powder has completely dissolved. Let sit 5 minutes to thicken, then fold in cool whip until combined. Pour 1/3 crushed oreos into pudding mixture and stir together, then fold in gummy worms. Transfer mixture to a large glass baking dish and top with remaining cookie crumbs. Use your hands to gently spread crumbs into an even layer. Take your strawberries and gently push them down in rows in the oreo topping. If using pebble candy, add them evenly amongst the rows of strawberries. Garnish with fresh mint and refrigerate until ready to serve.